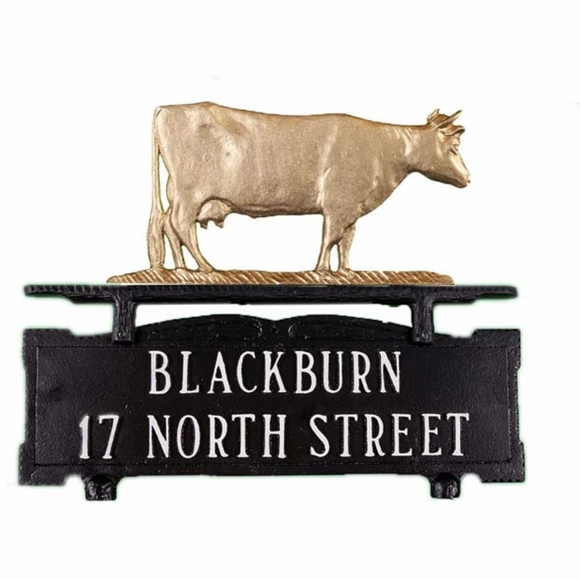 Personalized Mailbox Sign with Cow Ornament - - two-line mailbox address sign ships with a bracket and cow ornament. Mailbox topper attaches to your existing curbside style mailbox with the included hardware. Lettering appears on both sides of this personalized address plaque. Cow colors: gold bronze, natural black & white, swedish iron, and satin black. Personalized Mailbox Sign with Cow Ornament. Mailbox topper attaches to your existing curbside style mailbox with the included hardware. Nice looking product, but there was no padding between the shrink_wrapped sign and the side of the box. Some of the paint on the letters chipped off in shipping.